Saw these two items of interest on eBay today. Hours use on submarines have dial up to 24 hours,as it is under water is not the time of day,day or night. Well, you know what he means! Find this item here until 17-Nov-10 20:20:40 GMT. Use in intensive care wards in hospitals, waking up from an operation, not knowing where you are or what time it is,seeing this clock, immediately you are aware of the time day or night! This 24 Hour clock is a must for people with relatives overseas, set the clock to their local time and see at a glance if its night or day! 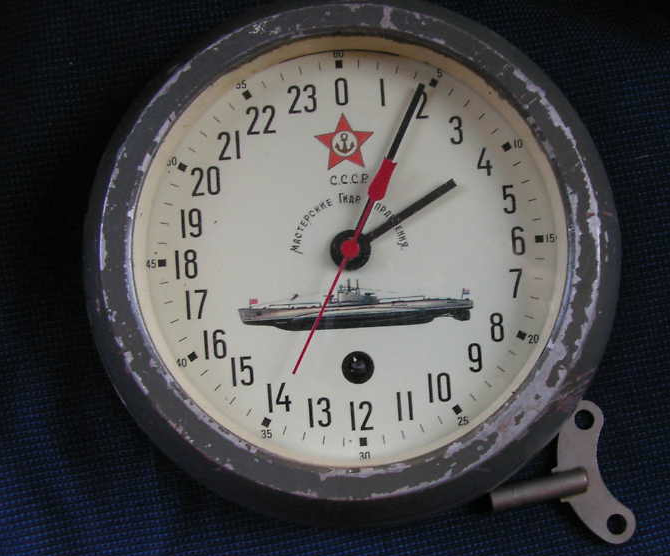 A black/white face, black/white hour and minute hands, hour markings for hours 1 thru 24, with minutes marked, a red second hand is provided. 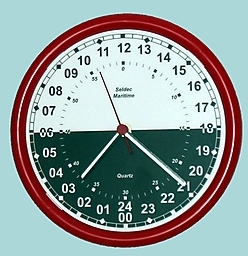 This clock differs from standard clocks in that the hour hand rotates only once every 24 hours, rather than twice as in standard clocks, thereby being able to indicate each of the 24 hours. Find this item here until 11-Dec-10 07:59:40 GMT.